Rainstorms was expected to pelt south China during the next three days as Typhoon Nalgae approached, forecasters said Sunday. More than 27,000 fishing boats have been called back to harbor in south China’s Hainan Province as strong tropical storm Nalgae is approaching, local authorities said Monday. Nalgae, downgraded from a strong typhoon Sunday afternoon, was located about 490 km east of Sanya in the island province at 8 a.m. Monday and was moving northwest at a speed of 15 km per hour, packing winds of up to 108 km per hour in its eye, the Hainan Provincial Meteorological Station announced in a statement. 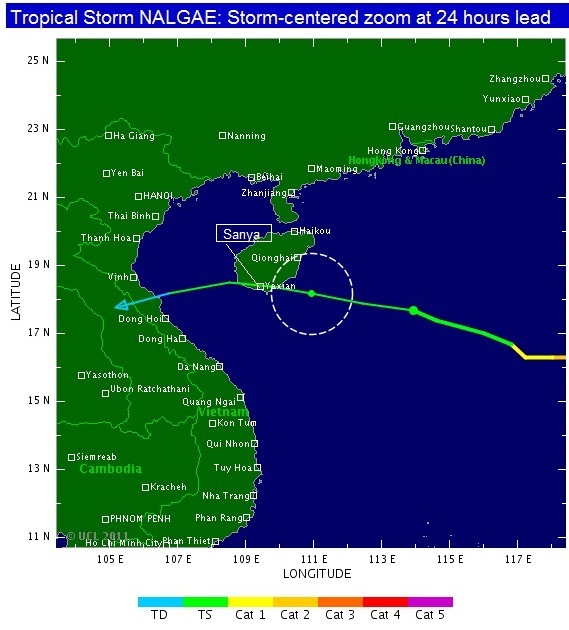 It is expected to make land in south Hainan or brush past the southern part of Hainan Tuesday, the statement said. Strong winds will hit the sea areas of Hainan in the coming three days and the meteorological station has issued a yellow typhoon alert early Monday.